How many of you have had this happen. You sit down to dinner with you family and just as you all start to enjoy the wonderful meal whining starts, or barking, or even better you feel a paw scratching at your leg. When you look down it is into the soulful eyes of your beloved dog. They are working it big time with those puppy dog eyes trying to convey how starving they are. And I just bet you or your children give in at some point. Hard to resist isn’t it? I have done it. I have given in to those eyes and the whining. But not any more. Begging is so cute when they are puppies or when they sit up with paws in the air. But when they get to be adults and the cute begging turns into more persistent demands it goes from cute to annoying. So here is my solution. Give them their own place and teach them right from puppy hood that is where they are to be during meal times. For some a crate might be a perfect solution to this. Not for me. I prefer their place be in the main room or an adjoining one where they can still see you but where they are out of begging range. The first trick is to no longer give into those begging eyes or the whining. If you must give left over’s then do so when the meal is over and give it to them in their dish. Next get them a blanket or mat that they will come to recognize as theirs. The purpose is you can move the blanket from room to room and the dog will know it’s place is where ever the blanket is. Works great when taking the dog visiting as well. Then get a 6 ft leash, this is for tethering the dog to their place till they realize this is where they are suppose to be. The leash is only in use till they are good at staying in their place. For adult dogs this can be as quick as a few weeks. For puppies it could be a few months. Figure out where in the room you want them to be during mealtimes. Then place their blanket there. Periodically during the day go over to the blanket, say the dogs name and then say place. Then bring the puppy or dog there and place then in a down. Then reward with either a treat or a toy. This is just to help them to associate the blanket and going to the blanket with the place command. When a meal time comes follow the same procedure but as they get put in their place attach the leash to their collar. The leash should be attached to something that will keep them in their area. Then reward with a chew toy. Tell them to stay and go have your meal. If they get off their place then get up and say their name and say place. Put them back on their place and reward. Ignore any and all whining. Do not even look at them when they do. Looking at them is a reward for the behavior. They will learn that meal time is time for them to either sleep or chew on their chew toy. After a while of doing this at every meal they will soon learn that begging is not allowed and where to be during meals. As they get better about staying on the blanket start testing them with not attaching the leash during mealtimes. If they leave their place put them back. If they do it more then 3 times then attach the leash and try again another day. They will catch on. Patience is the key. My three sleep on their blankets during meal time. 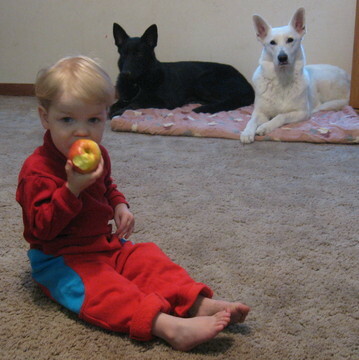 When guests are over to eat they always comment on how well mannered my three are during meals and with all the food around. This also makes meal times safer for everyone without the worry of tripping over a dog that is trying to beg for food around your feet. Give it a try. The peace it brings to a meal is well worth the effort.